Often taken for granted, the waylaying of the traveler is what makes the parable possible. Predatory behavior has bedeviled human history, and King gave a number of examples ancient and modern: slavery, colonialism, street crime, even preachers’ playing on people's religious desires in order to line their pockets. King’s fury was evident as he recited again and again the robber’s credo: "What is thine is MINE! And if you don’t give it to me, I’ll take it from you." The priest and the Levite evoke some sympathy. Not only does King understand something about religious professionals, they seem to have very ordinary motivations. The Jericho road through the Judean wilderness was known for its dangers. Are the robbers still near? Is this a trap? If they touch the man, whether he is dead or alive, they will become unclean and thus unfit for their duties at the end of their journey. And if the man is dead already, what sense is there in stopping? All this is very understandable and makes great sense. 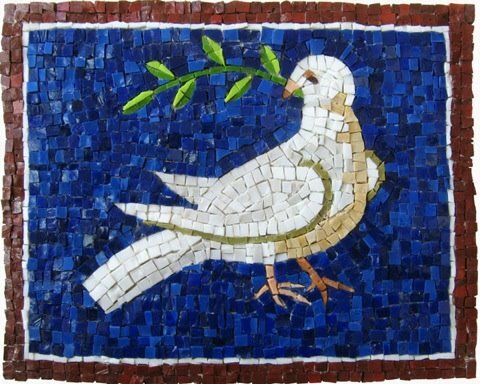 "And so the first question that the priest asked, the first question that the Levite asked was, "If I stop to help this man, what will happen to me?" (King, April 3, 1968). We know this philosophy, this way of living. Yet King indicts this attitude of cautious self-preservation, using Biblical stories, including his favorite parable of the rich man and Lazarus. (King inherited much of his thinking on this parable from the great preacher Vernon Johns, his predecessor at Montgomery’s Dexter Avenue Baptist Church.) It was not his wealth which sent the rich man to hell, but his failure to see the plight of his neighbor Lazarus, whom he passed by every day. And this attitude is found not just among the most powerful. It was in Dr. King's congregation, it is in our churches, it can be found whenever our time, talent, and treasure are devoted to the philosophy which segregates peoples' needs and gifts, letting some live in prosperity and others in poverty. Of course, the parable makes clear that the Samaritan, the one who does not pass by, the one who risks himself and gives of himself, is the true neighbor of the wounded traveler. "He who lives by this philosophy lives in the kingdom NOW! ", not in some distant day to come. This is the witness of Jesus, "who said in his own life 'what is mine is thine, I’ll give it to you, you don’t have to beg me for it.' This is why the cross is more than some meaningless drama taking place on the stage of history. In a real sense, it is a telescope through which we look out into the long vista of eternity and see the love of God breaking forth in the night.... It is God saying 'I will reach out and bridge the gulf that separates me from you.'" For King, the Samaritan neighbor has flipped the implicit question asked by the passersby (what will happen to me if I help?) and acts on the question "what will happen to the wounded stranger if I don’t help?" It is this, and his effective action to render aid, take the wounded traveler to safety, and subsidize his treatment that makes the Samaritan a good neighbor. Later on, King came to enunciate yet another view. You might call it a development of the "Good Neighbor" philosophy, a prophetic perspective, or even a God’s-eye view. King made use of his own experiences to understand something about the parable. "I remember when Mrs. King and I were first in Jerusalem. We rented a car and drove from Jerusalem down to Jericho. And as soon as we got on that road I said to my wife, 'I can see why Jesus used this as the setting for his parable.' It's a winding, meandering road. It's really conducive for ambushing. 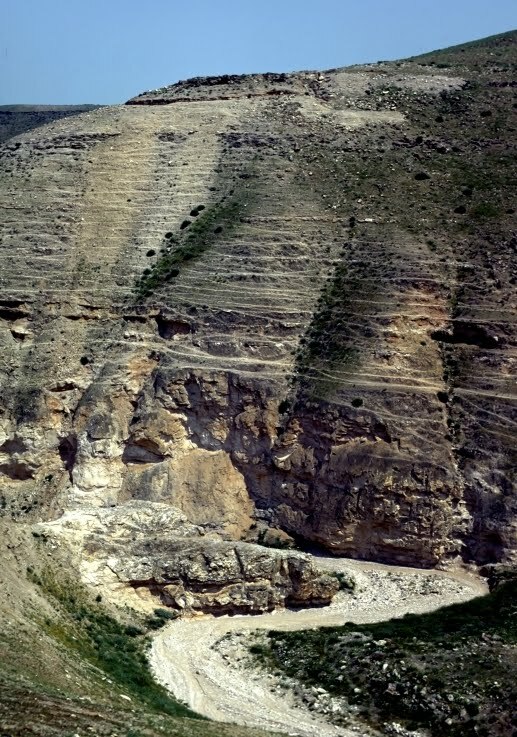 [The road descends nearly 3000 feet in elevation over only 20 miles between Jerusalem and Jericho.] That's a dangerous road. In the days of Jesus it came to be known as the 'Bloody Pass'" (King, April 3, 1968). Dr. King had come to know other dangerous roads. The road to integrated buses, waiting rooms, and lunch counters was a dangerous road to travel. The road to voting registration was a dangerous road for African Americans. The road to economic health and opportunity was a dangerous road for poor people. 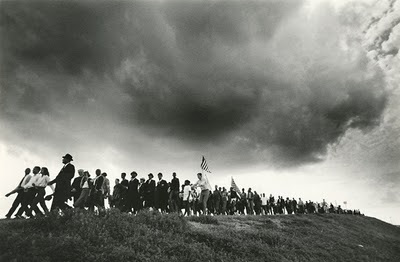 The road between Selma and Montgomery was a dangerous road when walked by integrated protesters. The road to justice - which must of necessity challenge those who depend on injustice - has always been a dangerous road. But King realized that the danger of these roads was not a feature of creation, but of social relation, and proposed a re-architecture of our social landscapes. There are many ways to improve the Jericho Road. 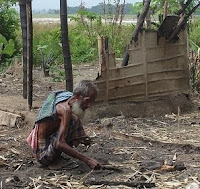 One is to send Good Samaritans down it to rescue those in trouble. Another might be better policing to protect travelers. Another might fund a public works project to straighten out some of the most dangerous spots. And still another might be the transformation of society such that few are tempted to become robbers. In this final step, King has gone beyond the parable, which was Jesus' goal in telling the story. Answering the question "who is my neighbor?" is only the first step. It is the way into the personal and collective transformation to which God is calling us. One might say that neighborliness is next to godliness. * NOTE: Some have objected to King "reading race" into the parable. While it is a commonplace of New Testament studies to understand Samaritans as an "other" to Jewish identity, not unlike blacks to American whites, the story itself contains a signifier that ethnic identity issues are present. 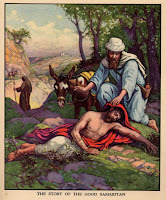 Jesus identified the final traveler as a Samaritan. But when he asks the lawyer which was a neighbor to the wounded man, the lawyer answers "The one who showed him mercy." Not many interpreters have been able to find ambiguity in who shows mercy in this story. Is it a stretch to see the lawyer as unable to say the word "Samaritan" in praiseworthy context? Unfortunately I have not been able to locate a full version of either King’s standard “Who Is My Neighbor?” sermon, or his May 3, 1964 version, which is quoted on p.302-3 of Taylor Branch’s Pillar of Fire: America in the King Years, 1963-65 (New York: Simon and Schuster, 1998). King, Martin Luther Jr., "A Time to Break the Silence", address delivered April 4, 1967, meeting of Clergy and Laity Concerned, Riverside Church, New York City. 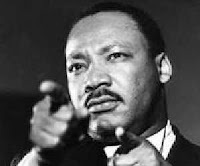 King, Martin Luther Jr., "I've Been to the Mountaintop", address delivered April 3, 1968, Memphis, Tennessee. SEE ALSO: Martin King: Prophet & Martyr. Great summary of MLK's analysis of the world situation. I had never thought about how to prevent robbers before but it all makes sense. Heard a Kenyan Pastor recently speak on Eph 4:28 addressing Chistians not to steal. Why would Christians steal he asked? The answer is obvious.